In addition to former Energy Secretary Stephen Chu and sessions on leadership training, Obamacare, and the state of the American construction economy post-recession, this year's 41st Annual Convention at The Mirage in Las Vegas will feature NDA in Paradise sponsored by Stanley LaBounty on Monday night, Feb. 24. Always one of the NDA's premier convention events this year's party will feature a seven-piece beach bum band playing some of Jimmy Buffett's greatest hits for all you Parrot Heads. The evening will also feature Steel Drum Trio and an island décor plus great Caribbean food. Sign up now for the NDA's 41st Annual Convention. Come join the NDA in Paradise. View the entire Convention brochure here! Have you secured pre-registration for the Annual Convention yet? If not you have until Feb. 14 to do so. To attend after that date you will need to register at The Mirage in Las Vegas at the beginning of the Convention. We look forward to another great turnout! Join us at noon on Saturday for the 27th Annual Golf Tournament. The Arroyo Arnold Palmer Course, located at Red Rock Country Club, is open to public play and is located in the master planned community of Summerlin in Las Vegas. The Arroyo golf course ribbons seamlessly through the rugged terrain and is nestled between the spectacular landscapes of Red Rock Canyon, one of Las Vegas' most revered natural landmarks. Two experts from FMI lead educational sessions on identifying growth markets over the next five years and building company talent at the National Demolition Association event, the largest exposition of demolition products and services in the world. It takes place Feb. 22-25 in Las Vegas. 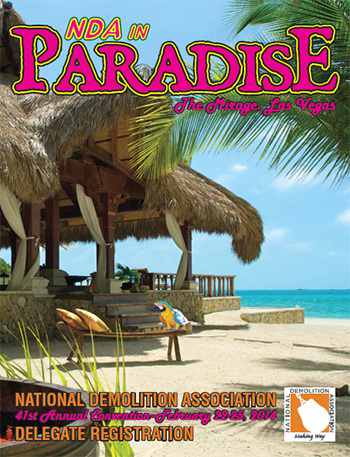 The National Demolition Association will be offering a Leadership Development Program during the association's annual convention in Las Vegas. The session will be held Feb. 23 and will be presented by FMI, a provider of management consulting services to the engineering and construction industries based in Raleigh, N.C. The program is limited to 30 attendees. With the successful completion the upgrading of the NDA's Demolition Safety Manual, the bible of safe work practice for the demolition industry around the world, the Association's Safety Committee has begun work to incorporate many of the improvements contained in the Safety Manual in the NDA's Demolition Safety Talks. There are 52 Safety Talks currently available in the existing program. The Safety Committee will be evaluating the content of each of these talks and adding additional tool box safety training material to the program, all based on the latest Demolition Safety Manual edition. Look for new Demolition Safety Talks in an easy-to-use online format later this year. Find deals to help you get organized and stick to your New Year’s resolutions from this month’s featured Merchant Partners and as always earn Links® Reward Points to reward yourself this year. The U.S. Department of Labors Occupational Safety and Health Administration is extending the public comment period for the Notice of Proposed Rulemaking on Occupational Exposure to Crystalline Silica for an additional 15 days to Feb. 11, 2014. The Ohio Department of Transportation began demolition this week on the closed 1959 Inner Belt Bridge. Demolition activity at a former power plant in Norfolk, Neb., that is now a United States Environmental Protection Agency Superfund site has been scheduled to begin in late January 2014. The University of California's release of data on nearly 1,500 older concrete buildings across Los Angeles marks a key step in the city's efforts to improve earthquake safety. Now the hard part begins. President Barack Obama pushed lawmakers to approve new funding bills for the nation’s roads and ports by "this summer" during his State of the Union address. The call came during a portion of Obama's speech discussing closing tax loopholes to pay for domestic improvements. Over the past decade, the U.K. construction industry has seen a rising interest in the use of natural crop-based building materials such as hemp and straw for the construction of new homes. Such materials were historically used in the construction of houses and farm buildings, typically in cob walls and for thatching roofs. But for decades the use of these materials has been in decline, apart from in the repair and maintenance of older buildings. It's been well-established that 3-D printers can make jewelry, cups and other trinkets. But labs and individuals are also venturing into larger items: rocket engines, art installments and so on. So why not go even bigger? The U.S. Transportation Department may have to slow reimbursement payments to states for roads and bridge projects during the peak of construction season to avoid emptying the Highway Trust Fund.